The San Pedro (Echinopsis pachanoi) cactus, is also known as the Trichocereus pachanoi. San Pedro Cacti grow reasonably fast, even from a cutting. They contain the psychoactive alkaloid Mescaline, responsible for the visual hallucinogenic effects. The San Pedro cactus grows native in the Andes Mountains of Ecuador and Peru and used by Shamans as a medicine and stimulant in rituals and ceremonies. These San Pedro mescaline cacti are cut and ready for preparation or further growing. The San Pedro cactus is the common name, but the cactus is known under names such as: Hachuma, Achuma and Aguacolla. The scientific name of the San Pedro cactus is Echinopsis pachanoi, this used to be Trichocereus pachanoi. This name change is the result of a new classification of cacti a few years back. The San Pedro mescaline cacti have been classified within a completely new family, the Echinopsis! 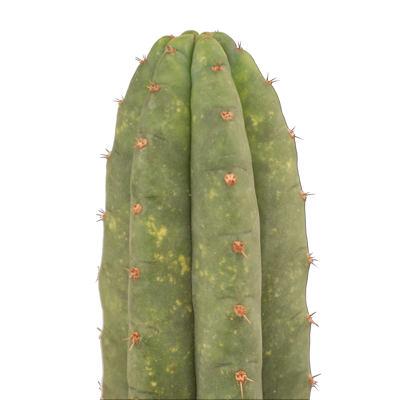 A San Pedro cactus grows quicker than the, also famous as mescaline containing peyote cactus . The San Pedro cactus can grow as much as up to 30 cm a year. Cacti up to 12 meters have been reported, but generally speaking the San Pedro grows to a respectable 3 to 6 meters tall. A cutting of the San Pedro can be transferred to a pot, or used for its mescaline after some preparation. Somewhere between 1 to 2 hours after consuming San Pedro you will feel the first effects of the cactus. Effects can last ranging between 8 to 15 hours and the peak of the trip is after 3 hours and can last up to 4 hours. The first effects are drowsiness and a dreamy state, you may feel tired and sleepy. Feelings of restlessness and nausea are common. During the peak of the trip; open and closed eye visuals; euphoric feelings and out of body experience can be expected. You may feel confused, increased tension on the muscles and insomnia. After the peak during the final part of the trip, the intensity takes a few steps back, but increased empathy; closed eye visuals, enhancement of light perception and details (a sharp eye) remain. San Pedros effects are seen as more manageable, controllable and gentle when comparing to the trips of Ayahuasca , LSD and Magic Mushrooms . A San Pedro cactus contains several alkaloids, including the well known Mescaline (0.21–1.8%). Mescaline is an alkaloid in the phenethylamine class. Other alkaloids you will find in the cactus are: 3,4-dimethoxyphenethylamine, 3-Methoxytyramine, 4-hydroxy-3-methoxyphenethylamine, 4-hydroxy-3,5-dimethoxyphenethylamine, anhalonidine, anhalinine, hordenine, and tyramine. How to use San Pedro Cactus? The San Pedro cactus can be ingested in different ways. From just eating the cacti raw to chemically extracting the mescaline. 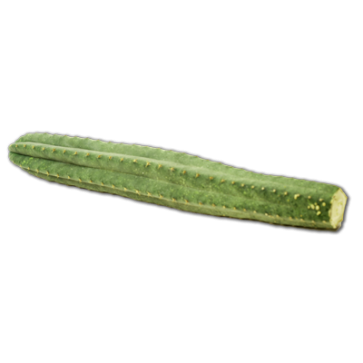 We'll describe two easy ways one can prepare the San Pedro cactus for consumption. This can be done easily at home: Eating San Pedro raw and brewing a tea of San Pedro cactus. A bit further you will find a simplified guide for mescaline extraction and a link to an extensive guide. That is easy! Remove all thorns, spines and prickles and start eating the San Pedro cacti like you would a cucumber, chewing every part of flesh and skin. The center of the cactus is the wooden like stem and can't be eaten. This method of ingesting could take a while if you have a big chunk of San Pedro cactus. Cut the San Pedro in slices. The center of the cutting is woodlike and can't be cut, so basically you'll be cutting stars with a round opening where the stem was. Put the slices in a food-processor to grind them to a pulp. Use the pulp to make a tea. Add boiling water and let it simmer for a while, then sieve or drink it straight up with the pulp. Add lemon for flavor and vitamin C. The latter helps to make you take up the mescaline better. Other preparation methods of San Pedro are drying, freezing, add ground San Pedro cactus to capsules or extracting the Mescaline. Simmering the sliced San Pedro in water for 5 to 7 hours. You will need to wash and cut up the San Pedro Cactus. Remove all thorns, spines and prickles with a sharp knife. Slice of the outer peel until you see a green pulp, this is were most of the mescaline is stored. Remove all the green pulp from under the peel for use. Put the pulp in a cooking pot with one liter of fresh water and let simmer for 2-3 hours. Sieve the residue to seperate the liquid (← this is your first extract) from the pulp. Simmer this pulp for a second time with just another liter of fresh water during 2 hours. Sieve this again and this time throw out the pulp. Add the second to the first extract into the cooking pot. Boil this down for a couple of hours until you have 250ml to 500ml (1-2 cups) left and your extract is ready. A far more complex technique is an acid-base extraction, 1 yielding a material with a significantly higher concentration of Mescaline. Would you like to go full ‘Breaking Bad’ on the San Pedro Cactus? Click here to read more about extracting and preparing the San Pedro cactus. The San Pedro dosage is hard to get exactly right since San Pedro cacti that grow under different conditions will produce varying amounts of active substance. One underarms length, and about the same circumference, of San Pedro cactus cutting should be enough to extract a good dose of mescaline. You can grow the San Pedro cutting by letting it root in cactus soil. Get a pot with a hole in the bottom, to let the excess water out. The roots should never be standing in much water as they will rot. Fill the pot with cactus soil mix, make a hole in the soil and plant the San Pedro. Ready to grow! San Pedro grows well in direct sunlight but also in partial shade. San Pedro is suitable for growing indoors or outdoors. The first year provide some shade avoid sunburns from hot direct sunlight and let it get used to your climate. Indoors: Make sure to water the plant consistently at least once every two weeks. Place the pot on a tray with water for an hour, allowing the roots to soak up the water. San Pedro cactus is better adjusted to watering than desert cacti. When the soil is still moist do not water the cactus! Outdoors: Water your cactus regularly, during hot summer days at least once or twice a week. The San Pedro will flourish in room temperature. If you want the San Pedro produce flowers it will need to go through the dormancy phase (the plants equivalent of hibernation) during winter. Starting in September or October, make sure the soil is dry as a bone and place the cactus in a cooler area (7⁰-10⁰C) until early May or April. During this period do not water or fertilize the cactus soil. The San Pedro will bloom in late spring. The San Pedro cactus (Trichocereus pachanoi) grows in the Andes Mountains of Ecuador and Peru on an altitude of approximately 2000–3000 meters high. The San Pedro is also found in Argentina, Bolivia and Chile, and it is cultivated in other parts of the world. The use of The San Pedro is goes as far as 1300 B.C. in Peru, images found on ceramic urns depicting the San Pedro. Reports of Peruvians drinking Achuma, a San Pedro containing drink, by the Spanish when they first arrived in Peru. Traditional use of the San Pedro is found true all of South and Middle America. Usage in rituals & ceremonies by native shamans, both as a stimulant and as medicine. In Peru and Bolivia it is used in a vision-seeking drink called Cimora. Another San Pedro containing drink is called Achuma. Apparently the powers of San Pedro can undo ‘love witch craft and counter al sorts sorcery’. The non-traditional use of San Pedro is mainly recreational. Due to its psychedelic properties derived from the alkaloid Mescaline the San Pedro is used for taking a psychedelic journey called ‘tripping’. Recently the Echinopsis pachanoi is used in therapeutic, ‘self-healing’ sessions and even in microdosing. The San Pedro is commonly available as a potted cactus for ornamental use.